Currently, in Ontario and most jurisdictions across Canada, housing for people with special needs or disabilities is designed, owned, operated and supported by traditional social services agencies that rely primarily on provincial funds. In Ontario this also means that resources are in high demand, access decision-making is centralized and wait-times are 10-years or more. While this may manage scarce public funds it is most often limiting and, at times, detrimental to the health and wellbeing of the person in need of a home, and of their family caregivers. Far too often the reality of the space ‘offered’ to the person awaiting a home will be outside their own community, family and friends. Severing hard-won community connections and friendships. in order to have access to a “placement” in a ‘funded’ home able to meet just basic needs. This is a troubling often terrifying outcome faced by families, who have literally given decades to the care and raising a son or daughter with special needs, in Ontario. This is a fear that can be replaced with hope built on initiative, control and confidence by pairing families with other like-families and community champions – individuals, organizations and donors. Communities must partner together with families and their loved ones to encourage, excite, and inspire awesome natural progressions to adulthood, regardless of ability. The province of Ontario has been attempting to meet the needs of people requiring support through government funding. However, this creates two problems. First, there is not enough funding to meet the needs of all the people who require it. Therefore, the dollars are stretched, replacing the right for a quality of life with the need to provide a quantity of service. People find themselves being plucked away to homes they do not recognize, with people they do not recognize, in neighbourhoods they do not recognize, limited by available funding. Often, due to a crisis, such as aging parents or the loss of a parent, people who live with disabilities go from a typical, loving family environment to a staffed, congregant living environment, literally overnight. The primary funder for adult housing options in Developmental Services is the Ministry of Community and Social Services (MCSS). In 2011, MCSS created Developmental Services Ontario (DS0), an agency whose purpose is to help adults with developmental disabilities to connect to services and supports in their communities, and, in part, to centralize vacancy management for core MCSS-funded programs, including residential options. Despite the Ministry’s best efforts to provide supports, funds are limited; waiting lists are extremely long and wheelchair-accessible housing stock is mostly unavailable. For our community of Peterborough County, as noted in the DSO newsletter bulletin dated February, 2015, from April – December 2014, for the Peterborough region, 73 vacancies were filled from a wait list of 5,059. This means, the young men supported by Shared Dreams guys could, potentially be “awarded” a “funded bed” sometime over the next 69 years, somewhere within the Central East Region of Ontario. 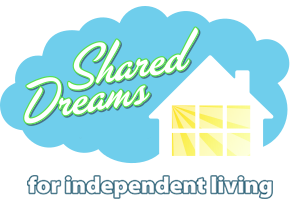 Shared Dreams for Independent Living was founded by families who want to make a positive impact on outcomes for people who live with disabilities – on one hand, because their sons deserve a home of their own, and, on the other hand, because they want to blaze the way for other families to be excited about their sons’ and daughters’ futures, rather than lying in bed at night, worrying. Shared Dreams is very strong and committed. Members are very active in the community as individuals and as a whole. This is a group of families who have grown together through the years, and have learned from one another “the best” ways to raise their sons to be strong and determined, but mostly happy. The group has also learned from the agencies in Peterborough who encouraged them to be strong advocates for their sons. Peterborough is a community that embraces diversity and responds well to the ideas of positive change and the members of Shared Dreams are proud to call it home. Shared Dreams has already engaged in several formal and informal partnerships in the Peterborough community. Community Living Peterborough, Kawartha Participation Project, Habitat for Humanity, The City of Peterborough, Page Creations, St. Joseph at Fleming, Peterborough, Victoria and Newcastle Catholic District School Board, as well as several private businesses, have offered their support and partnership as the group moves along on their journey.